This Three Bean Vegetarian Chili is MEGA flavorful, comforting and packed with protein and seasonal flavors. On my last post >>this one<< I made a steamy announcement and promised to spill the beans at a later post. This later post happens to be this one, because it would make perfect sense to tell you that I am (drum-roll please!✨) –the new vegetarian in town– while sharing this deeelicious Vegetarian Chili! Okay, no need to panic! Becoming a vegetarian is something that I have been considering for a long time. For years I have struggled with hormonal issues, and have researched and read enough to consider the option. For me this is specially hard because I reeeeally love and appreciate all types of food. But perhaps when it comes to meat products, the feeling isn’t mutual. Time to break up with what’s messing me up! Nothing! Well, maybe a little. Do expect to see more vegetarian recipes, like this Vegetarian Lasagna (above) and Vegetarian Chili, to give you tasty ideas and suggestions on how to incorporate more vegetables in your diet, whether you are a vegetarian or not. Do NOT be alarmed or confused if you still see meat recipes coming from me. I have a family of 6 to feed, and they love meat! Fall. Chili. Cozy blanket. Warm drinks. What else do we need? This Vegetarian Chili is packed with protein from three types of beans; pinto, kidney and black. The butternut squash adds a delicious touch of seasonality while giving the dish a fun contrast of flavor and more nourishment. 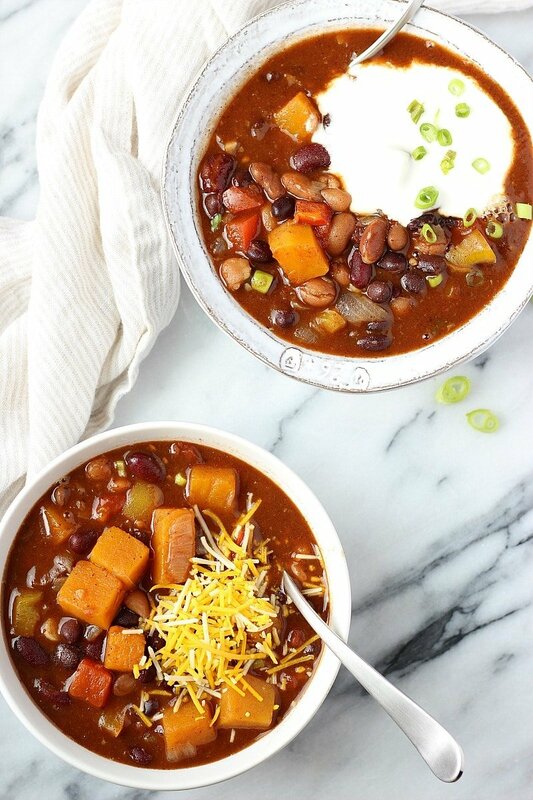 This chili is MEGA flavorful, comforting and incredibly fulfilling. 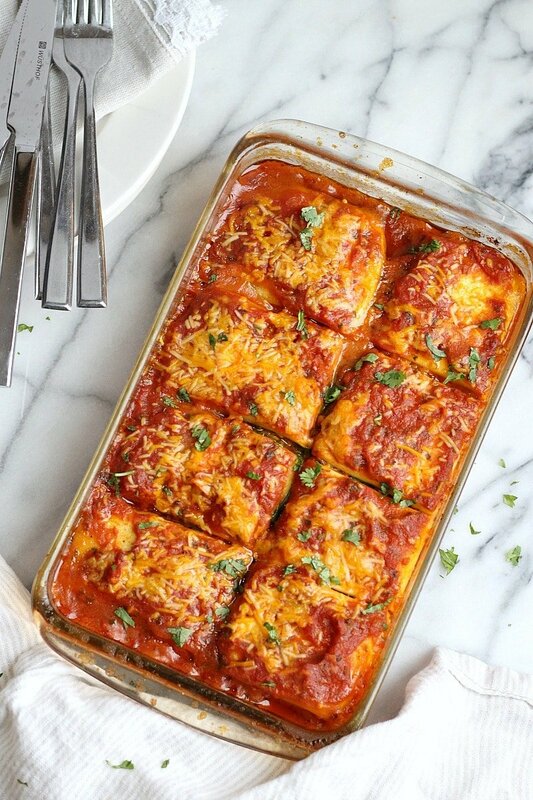 A tasty recipe that is perfect for a weeknight! 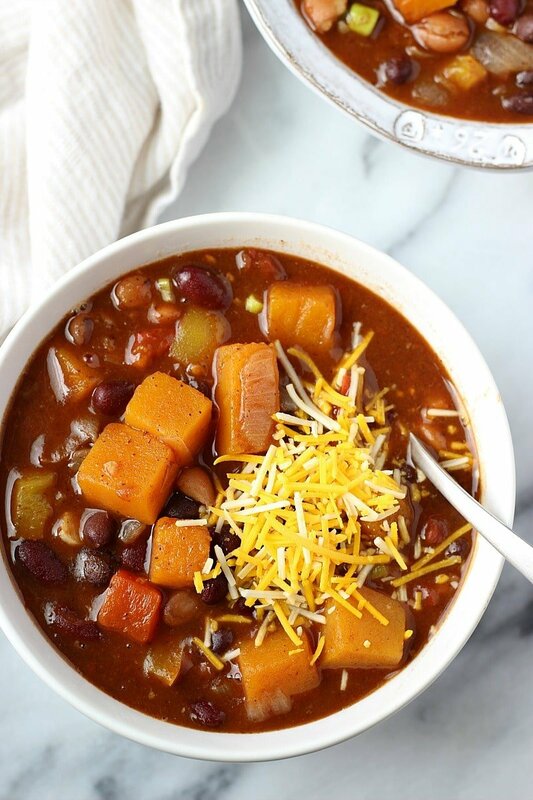 This Three Bean Vegetarian Chili is packed with protein, with a sweet contrast from the butternut squash. A nourishing and comforting dish for the whole family to enjoy! Heat oil in a large soup pot or dutch oven. Add in onion and sauté for 2 mins or until transparent. Add in garlic and sauté for another minute until fragrant. Add cubed butternut squash, red and yellow pepper along with salt and seasonings and allow this to sauté for about 8-10 minutes, stirring in between just enough so ingredients won’t stick to the bottom. This process of infusing flavors is the key to a very flavorful chili. Lastly, add in beans and tomato sauce. Give it a stir, cover and turn the heat to medium low. Cook for 30 minutes. Serve with your favorite choice of topping. Great for freezing! 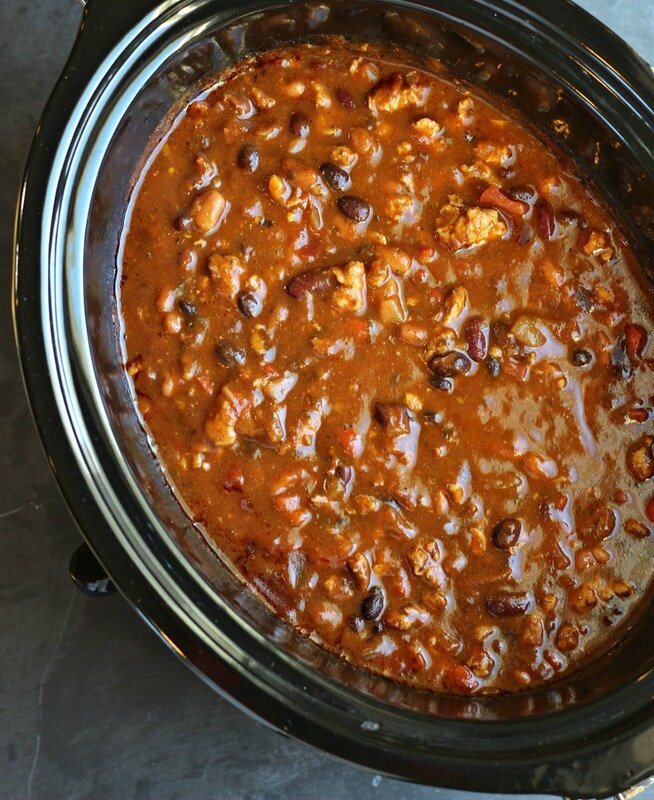 Check out this delicious Slow Cooker Turkey Chili! Good for you on your decision to become vegetarian! 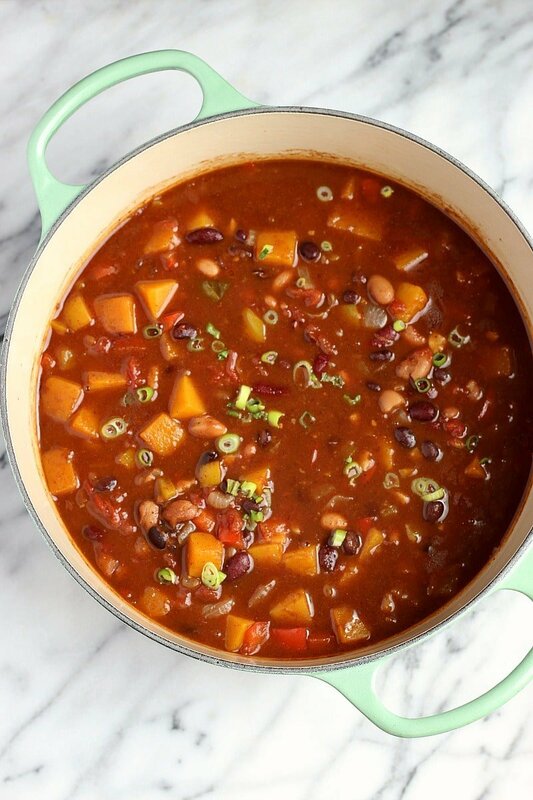 Your 3 bean vegetarian chili looks so good! The hubbers and I are refinishing our kitchen floor, so we’ll be without an oven for a while. I’m searching the net for tasty looking crockpot recipes and I’m sure your recipe will fit the bill!